Today’s students must be capable of adapting to the rapid changes in technology in order for them to be prepared for college and career. 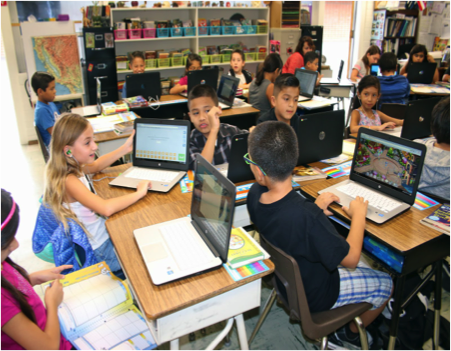 The East Whittier City School District recognizes the importance of technology for our children’s future and is invested in utilizing devices to enhance instruction in the classroom and provide opportunities for students to leverage technology to achieve learning goals. The EWCSD primarily utilizes Chromebooks for student use. The distribution and implementation varies depending on grade level. See the outline below for full detail. Various devices available to kindergarten students: ipads, chromebooks, etc. 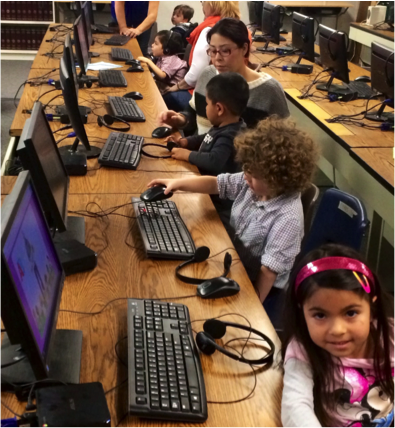 The EWCSD uses a variety of digital tools and curricular resources to enhance instruction. See the outline below for full detail. RI (SAM): Reading Inventory is a reading comprehension test that assesses students’ reading skills. Pearson Realize: Online platform for our adopted elementary math program, enVision Math, and our adopted middle school social studies program, myWorld Interactive. Go Math: Online platform for our adopted middle school math program, Go Math. Google Classroom: Online platform for students and teachers to collaborate and communicate with each other. Google Drive: Cloud service that allows teachers and students to create and collaborate on Google Docs/Sheets/Slides/Drawings/Etc, store, and organize files for free.